LIMA, Peru (AP) — Members of an Indian tribe that has long lived in voluntary isolation in Peru's southeastern Amazon attempted to make contact with outsiders for a second time since 2011, leading to a tense standoff at a river hamlet. They asked for bananas, rope and machetes from the local Yine people but were dissuaded from crossing the river by FENAMAD rangers posted at the settlement, said Quicque, who directed them to a banana patch on their side of the river. The incident on the Las Piedras is chronicled in video shot by one of the rangers and obtained Monday by The Associated Press. "You can see in the images there was a lot of threatening — the intention of crossing. They practically reached mid-river," Quicque said by phone from Puerto Maldonado, the regional capital. The video shows Mashco-Piro of all ages and sexes, including men with lances, bows and arrows. In one image shot during a moment of tension, a man flexes his bow, ready to shoot. Quicque said the estimated 110-150 people living in Monte Salvado "feared for their lives." He credited the ranger, Rommel Ponciano, for keeping a cool head. He said 23 Mashco-Piro appeared on the first day, 110 on the second and 25 on the third. The clan left and hasn't returned. "They spoke a variant of Yine," Quicque said, but Ponciano understood only about two-thirds of the words. 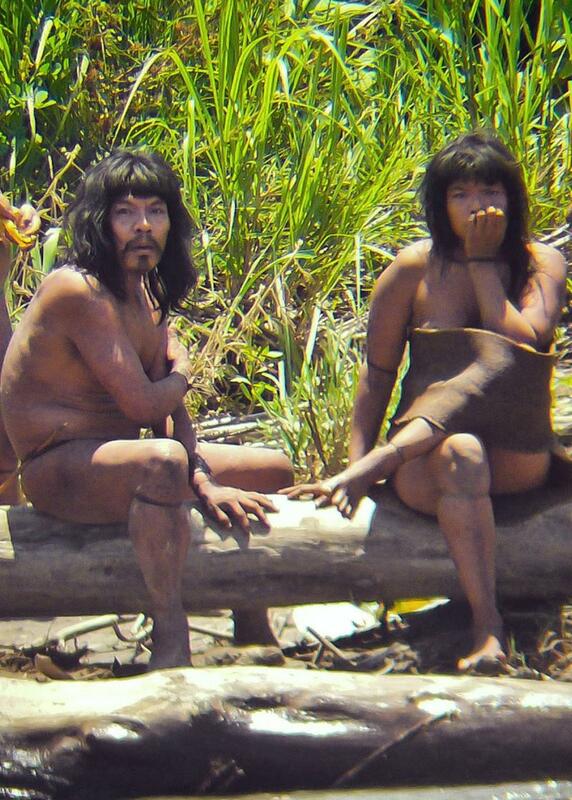 The Mashco-Piro live by their own social code, which includes kidnapping other tribes' women and children, according to Carlos Soria, a Lima professor and former head of Peru's park protection agency. Peruvian law prohibits physical contact with the estimated 15 "uncontacted" tribes in Peru that together are estimated to number between 12,000 and 15,000 people living in jungles east of the Andes. The main reason is their safety: Their immune systems are highly vulnerable to germs other humans carry. Anthropologist Beatriz Huertas, who works with Peru's agency for indigenous affairs, says the Mashco-Piro are becoming increasingly less isolated. The tribe is believed to number in the hundreds in several different clans. It is not unusual for them to appear where they did during a season of sparse rainfall when rivers are low, and they tend to be itinerant, she said. "What's strange is that they came so close to the population of Monte Salvado. It could be they are upset by problems of others taking advantage of resources in their territories and for that reason were demanding objects and food of the population," Huertas said. Naturalists in the area and national park officials say the tribe's traditional hunting grounds have been affected by a rise in low-flying air traffic related to natural gas and oil exploration in the region. Quicque said the Mashco-Piro were victimized by "genocide" in the mid-1980s from the incursion of loggers, and subsequently engaged in battles with mahogany-seekers. Members of the group reappeared in May 2011 on the banks of a different river after more than two decades in voluntary isolation. After those sightings, and after tourists left clothing for the Mashco-Piro, authorities barred all boats from going ashore in the area. Mashco-Piro were blamed later in 2011 for the wounding of one forest ranger and the killing of a Matsiguenka Indian who had long maintained a relationship with them and provided them with machetes and cooking pots.